Phevos and his sister, Athena, were part of an Italian traveling circus and later were moved to a zoo in Trikala, Greece. Athena cut her foot on a Christmas ornament in 2012 and developed an infection after receiving no treatment for six months. 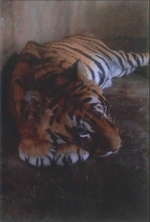 She died of neglect, but Phevos will have a better future thanks to the efforts of Bobbi Brink, founder of Lions, Tigers and Bears rescue facility in Alpine. Lions, Tigers and Bears provides spacious enclosures complete with a pond, waterfall, room to run and climbing equipment for its tigers.